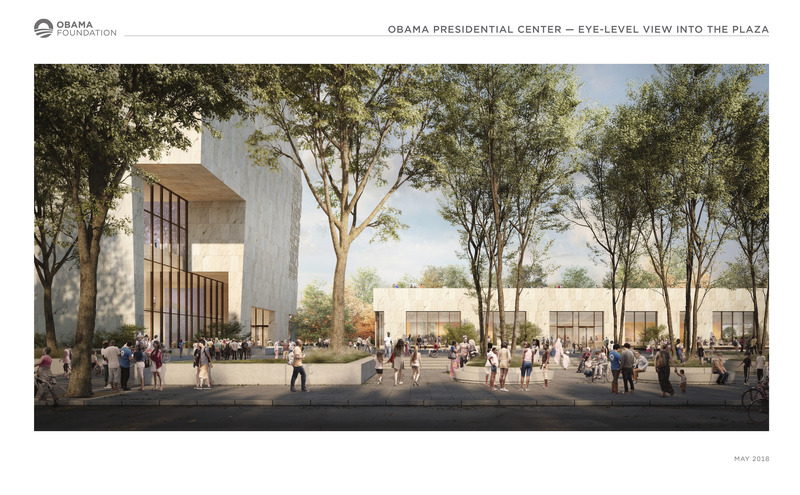 The Obama Presidential Center represents a historic opportunity to build a world-class museum and public gathering space that celebrates our nation’s first African American President and First Lady, steps away from where he began his career, where she was raised, and where—together—they made their home. The Center will be a new landmark for the South Side and an economic engine for the city of Chicago. 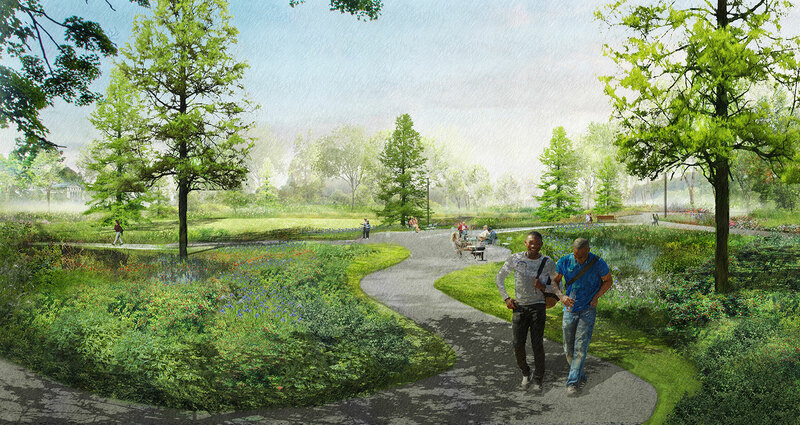 It will draw hundreds of thousands of visitors every year, creating thousands of new jobs on the South Side, while giving new life to Frederick Law Olmsted’s vision of a cohesive, walkable, and iconic Jackson Park. 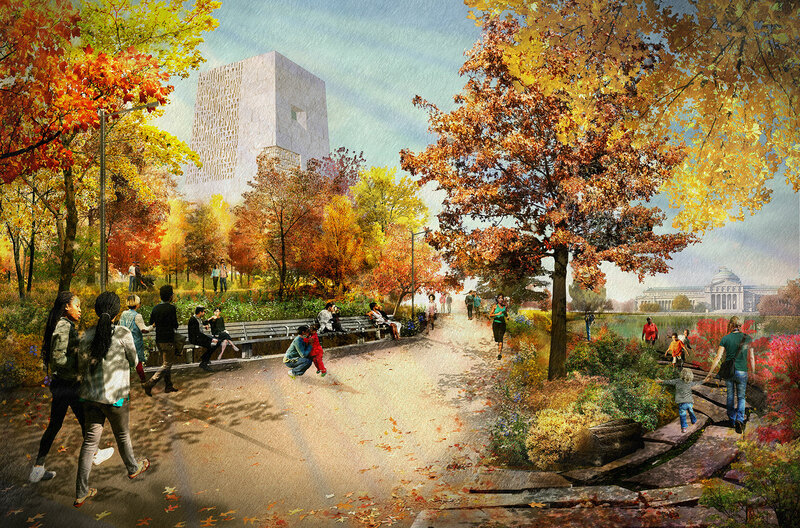 The campus will remove barriers and seamlessly connect the park to the lakefront, unifying it with other local South Side institutions. It will be a place for all seasons, with winding landscapes, a sledding hill, and quiet spaces to read or reflect. As with other museums in Jackson Park, the majority of the space will be free and open to the public. But most meaningfully, by celebrating President and Mrs. Obama’s legacy, the Center’s Museum will remind young visitors—whether they’re from the South Side or the Southern Hemisphere—that their potential is limitless. The Museum building is a tower—representing ascension, hope, and the power ordinary people have to change history when they work together. 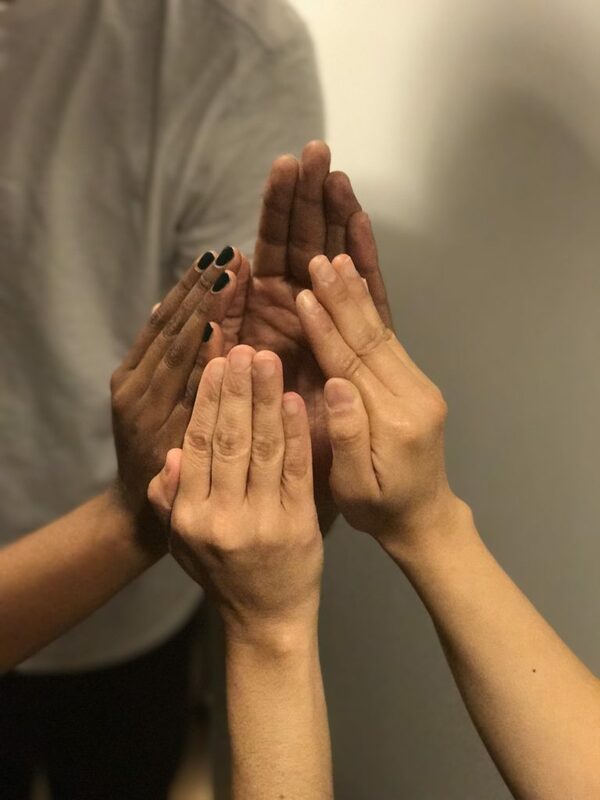 Its design was inspired by a photo of four hands coming together. Like these hands, each facade of the four-sided tower will be a little different from the next — enhanced with texture and detail, and offering a beautiful and unique experience from all angles. The Museum will serve as a historic landmark in Jackson Park, welcoming visitors to South Side and the Center. 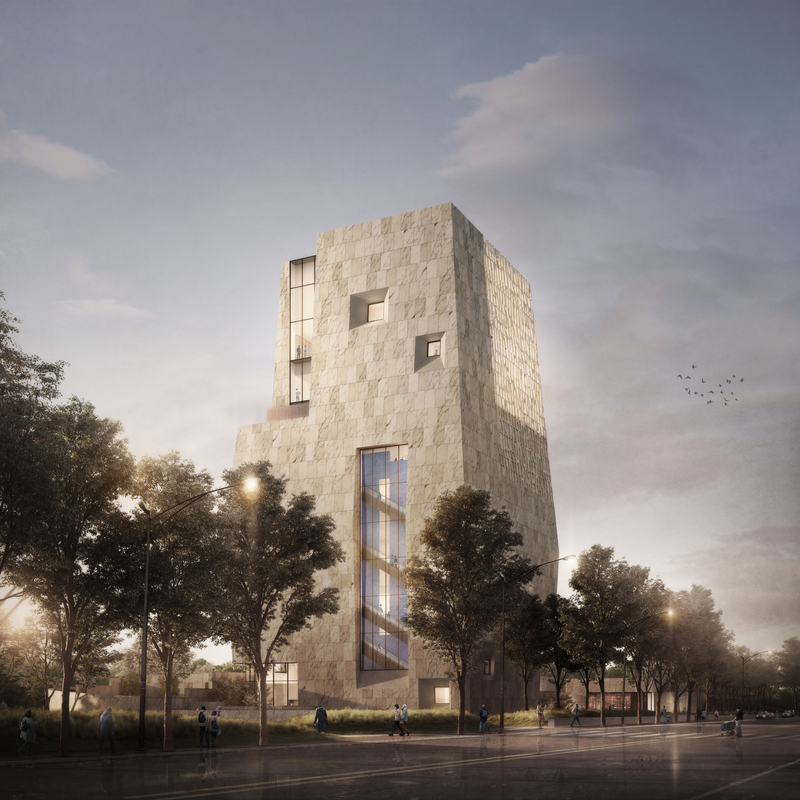 Its lower floors will house exhibitions that tell the Obamas’ story within the context of history: civil rights history, African-American history, the history of Chicago, and United States history. 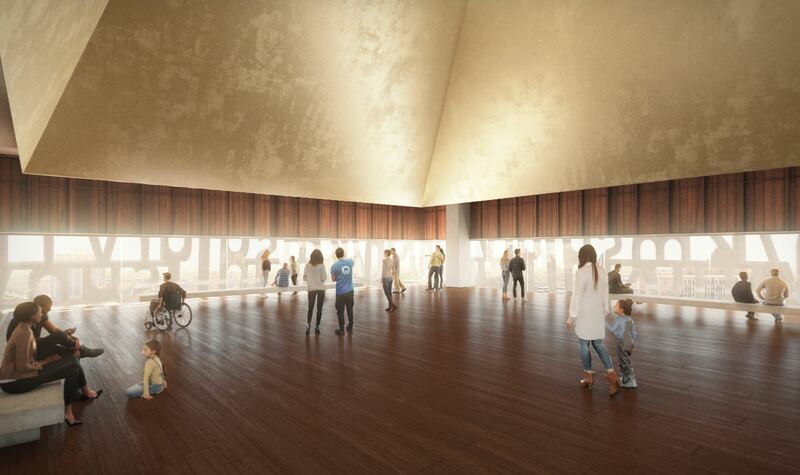 The rest of the building will be filled with other public spaces, including a top floor, free and open to the public, that will feature a reflective observation space with spectacular views of Lake Michigan and Jackson Park. The Forum is a two-story public meeting space where people of all backgrounds can come together for programming. Visitors might take in a performance in the auditorium, create something in the broadcast studio, visit the public winter garden, or grab a bite to eat in the restaurant. Like much of the Campus, the majority of this space will be free and open to the public. By celebrating President and Mrs. Obama’s legacy, the Center’s Museum will remind young visitors—whether they’re from the South Side or the Southern Hemisphere—that their potential is limitless. The Library Building is the third main building of the campus — a portal for visitors to engage with the world beyond the Obama Presidential Center. We are partnering with the Chicago Public Library to bring a new 5,000-square-foot public library branch to Jackson Park. As a Chicago Public Library, it will house a multimedia collection with a focus on civic engagement and conduct programming to engage community members. The initial vision for the library includes spaces for reading and study (including homework help) that can be converted to open seating for programs and events; a dedicated children’s area and space for a program called YOUmedia, which lets teens explore the world and their own creativity using new technologies; and meeting space that will be available for public use. Adjacent to the library, we plan to include a special collections reading room, which may host a rotating series of small exhibits. The Museum, Forum, and Library Buildings will wrap around a community-facing public plaza that will act as another gateway into the park. We’re envisioning the plaza as a public space for the local community — a place for informal and planned gatherings alike. It will host performances of all types, from celebrations honoring local figures to markets and fairs. 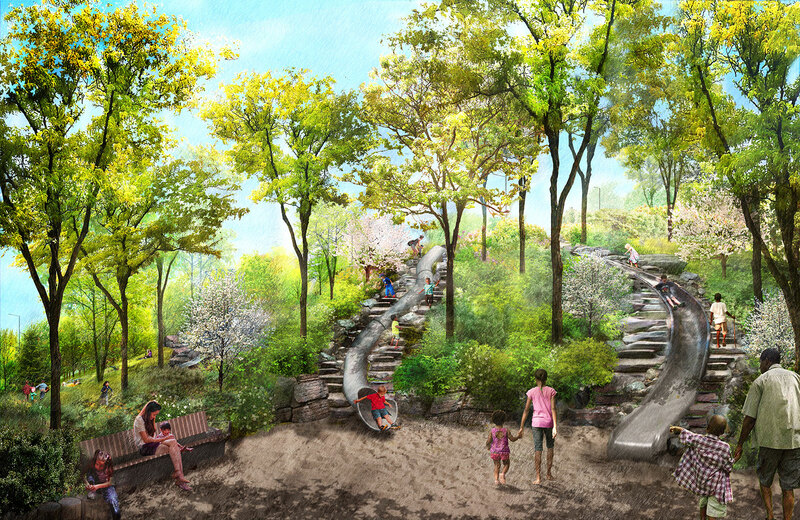 There will be play areas, walking paths, and even a sledding hill. The Program & Athletic Center will invite the community to take part in physical activity year round, highlighting the importance of teamwork and exercise through sports. It will provide opportunities for programming partnerships with local institutions, including Hyde Park Academy, the South Side YMCA, and the Chicago Park District Field House. 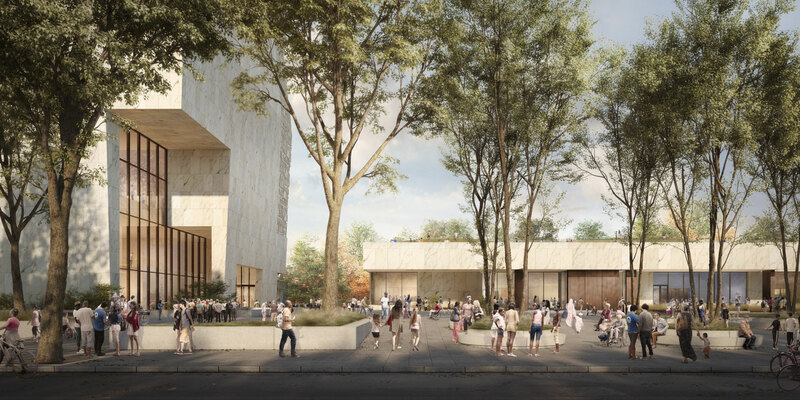 The architecture and design firms dreaming up the Obama Presidential Center alongside us are Tod Williams Billie Tsien Architects | Partners (TWBTA) and Interactive Design Architects (IDEA) as their partner. TWBTA stood out to the Obamas for their commitment to explore the best ways of creating an innovative, engaging Center, while IDEA brings local knowledge and an excellent track record for creating large, complex civic projects. Learn more about our team of architects. Michael Van Valkenburgh Associates will lead our landscape architect team in partnership with Site Design Group and Living Habitats, two Chicago-based firms. This highly skilled and diverse team brings a commitment to creating accessible public spaces that honor their environment, community, and history. Learn more about our landscape architects. 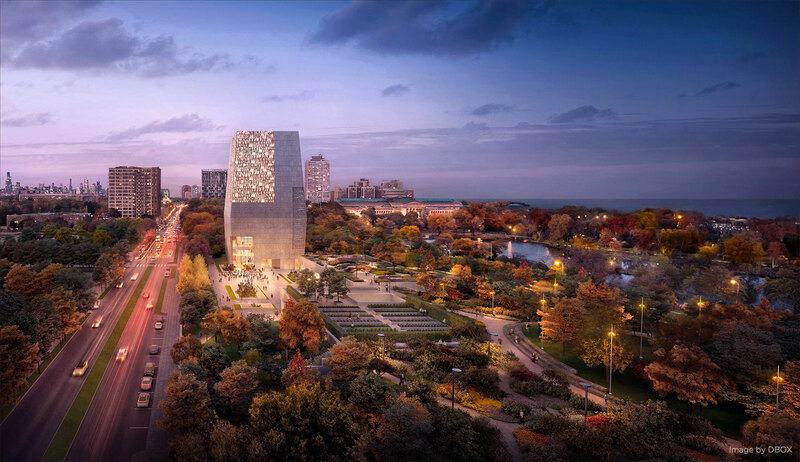 An eye-level view of the plaza at the future Obama Presidential Center, surrounded by the Museum building and programming spaces open to the public free of charge. View from the proposed promenade along the Lagoon at the east side of the campus, showing the Museum Building -- a landmark to welcome visitors to the OPC -- and the Museum of Science Industry beyond. 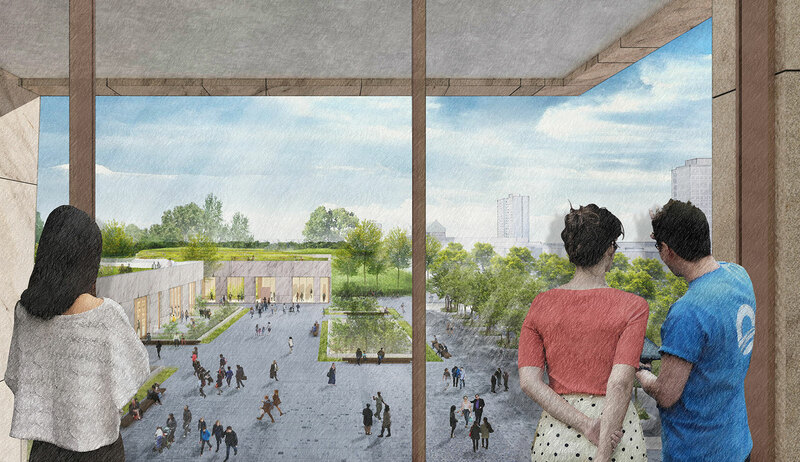 Looking out from the Museum Building, visitors will see a large public plaza tucked into the Park and four buildings that comprise the campus: the Museum Building, Forum Building, Library Building and Athletic Center. 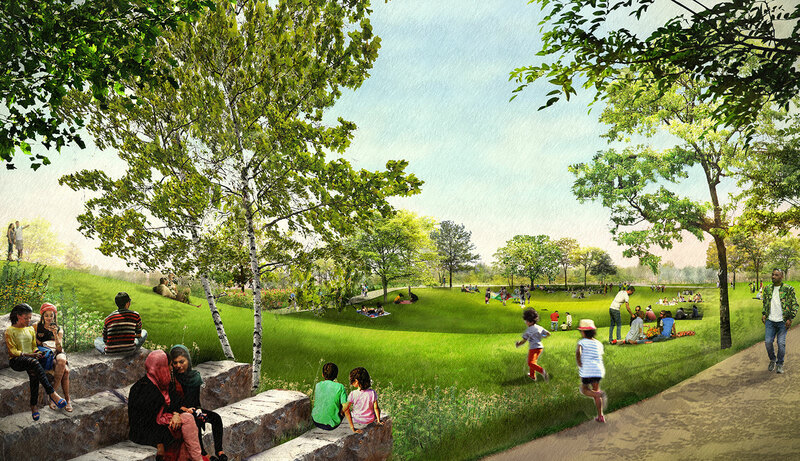 The landscape design will reconnect the currently separated parts of Jackson Park and create safe and open spaces for children to play and for friends and family to gather. The campus will also maintain connections to the park and its features, including the Lagoon and Lake Michigan. A Great Lawn will allow people to use the park for different experiences, whether recreational or contemplative. 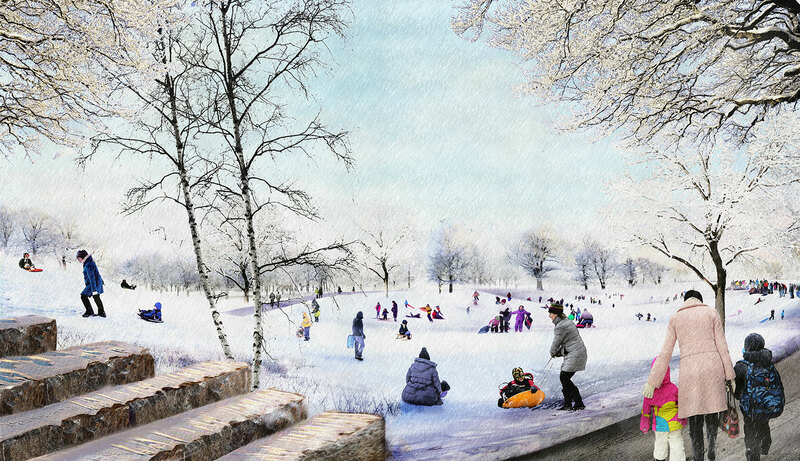 The OPC will be a campus for all seasons, with the Great Lawn doubling as a sledding hill during the winter months. The OPC is designed to create a welcoming and engaging space for children and young adults that will allow them to have fun, learn, and be inspired, and will include play areas.